WACHT am Rhein, the Battle of the Bulge, is a grand-tactical simulation of that enormous battle. The more than 2,380 counters represent every formation, at company and battalion levels, which fought there, including US, German, British, French, Canadian and Belgian units. Infantry, armor, anti-tank, reconnaissance, engineer, assault gun, howitzer, rocket, parachute, ranger, glider and headquarters units are all fully represented. The four maps are an accurate representation of the region. Compiled from 1944 German staff maps and 1943-44 1:50,000 US Army maps, they shows all roads, trails and other types of terrain, along with all the towns and villages that became bastions of the American defense, as well as every creek and river that couldn’t be crossed by wheeled vehicles without a bridge. 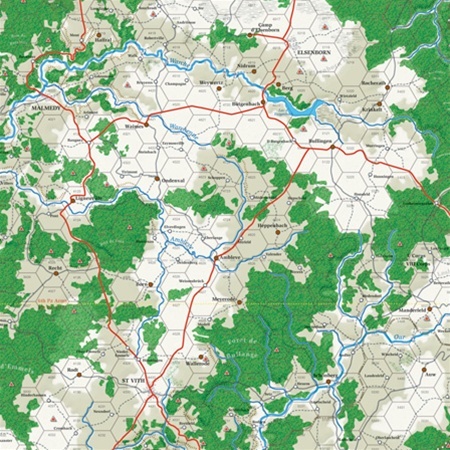 PLAYERS may use single maps for six smaller scenarios. There is also a campaign game that utilizes all four sections and portrays three weeks (50 game turns). In that one the Germans race for the Meuse, the last hurdle before the open country leading to Antwerp, in the face of increasing concentrations of Allied infantry, armor and air power. Extensive supply, weather and air power rules are included. 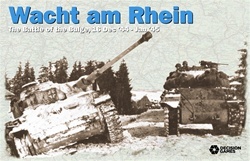 THIS edition of Wacht am Rhein presents modifications to the combat, artillery and supply systems of the first edition in order to better depict tactical and operational warfare. For example, an “exploitation mode” has been added in order to allow mechanized units to take advantage of breakthroughs in the enemy line. Other changes include the addition of “vantage points,” which function as high ground, enabling units to spot more effectively for artillery, as well as “constricted terrain,” which represents the channeling caused by steep gullies and ravines. Units: Infantry and Artillery units are battalions. Armor is depicted at the company level. Each strength step is equal to a company. Good game, although the rules are a bit difficult. Been waiting for years for DG to publish the Random Events Tale - which is promised in the rules themselves - but still not published yet - emails on the topic go unanswered. Some historical units are missing. Major Issue: No provision (or units) for units which are under strength at start of game to be built up to full TOE strength. This was game that introduced me to GOSS system. Have since acquired Atlantic Wall. It is a highly rewarding gaming experience. Tactical feel at operational level. If you can get past rule book organization it is worth the effort. I bought this game years ago when it was first published. Main problem then was finding space and an opponent! LOL I now have space and have opponents. I have enjoyed this first installment of the GOSS system and have enjoyed the playing of the first 2 games in that system. For those that enjoy having your mind fully excercised this game, and the series, are the games to get!! The map, counters, and rules are well printed. I own a copy of the latest edition.